The temperatures are cooling off, and that means I’m adding to my stash of warm layers. 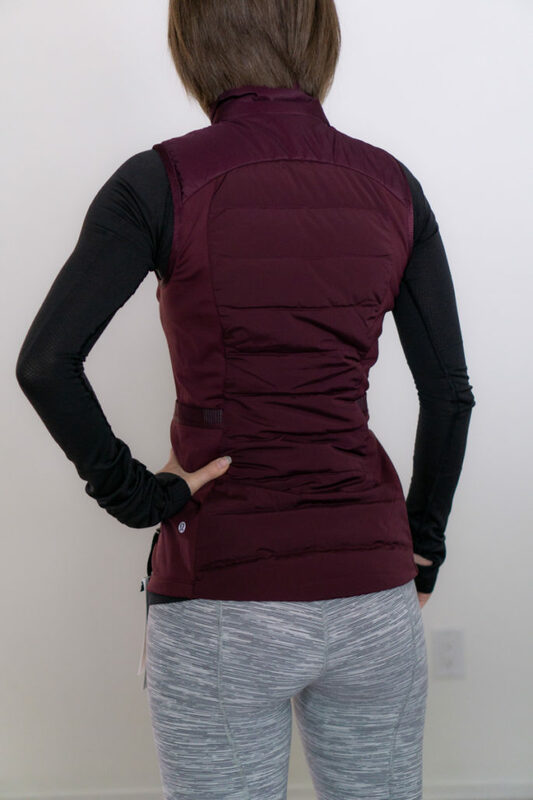 I decided to try out lululemon’s newest insulated vest, the down for it all vest in beautiful dark adobe. 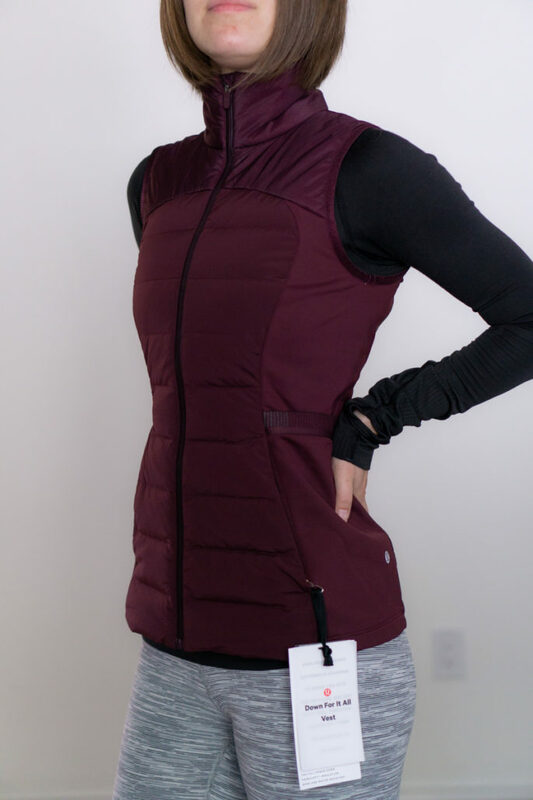 The down for it all vest is designed for running or other active outdoors activities, so it’s a low-profile design intended to stay out of your way, and is therefore less puffy than a casual vest. 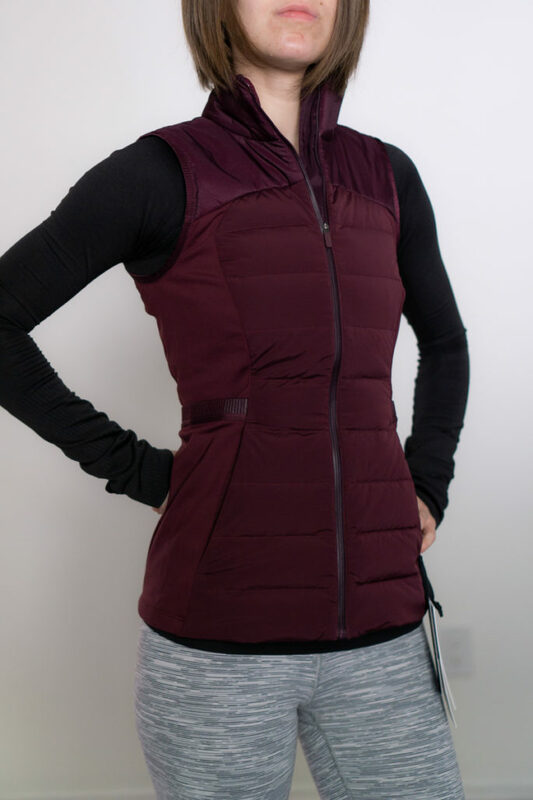 The primaloft-insulated body feels nicely warm, and feels just a tad bit thicker to me compared to some of lulu’s previous insulated running vests. That said, it’s still a light-to-medium weight insulated vest that isn’t suitable for ultra-cold temps. Don’t expect full puffer weight. 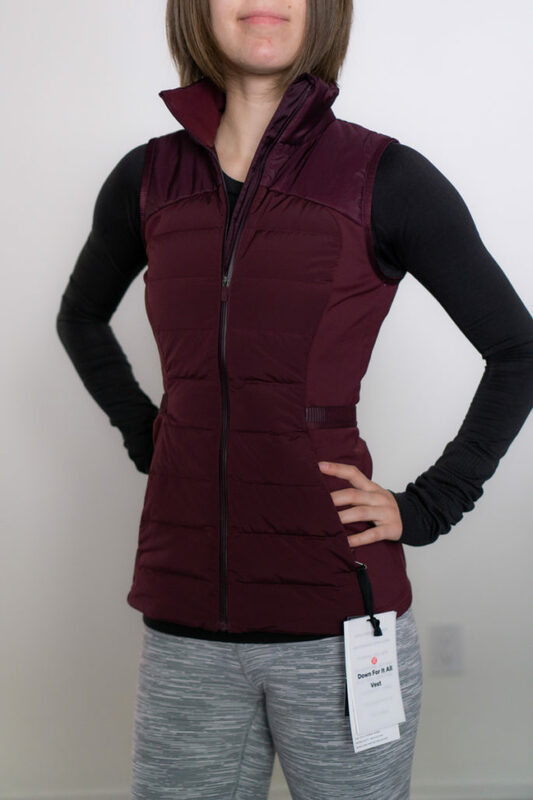 I purchased this vest in a size 2, my normal lululemon size in tops and outerwear. It fits close to the body but isn’t skin-tight. The overall effect is quite flattering. I could layer a thermal top and tank underneath. For more room for bulkier layers, I recommend going up a size. Unlike previous years, the body is completely matte and has a slightly rougher texture rather than a silky, shiny finish. The body is water resistant and the side panels are made of tech fleece. Note that in the online photos (including some of mine), the shoulder panels look much different from the rest of the vest, which I was a bit worried about. In real life, the fabric on the body and the shoulders looks virtually indistinguishable. 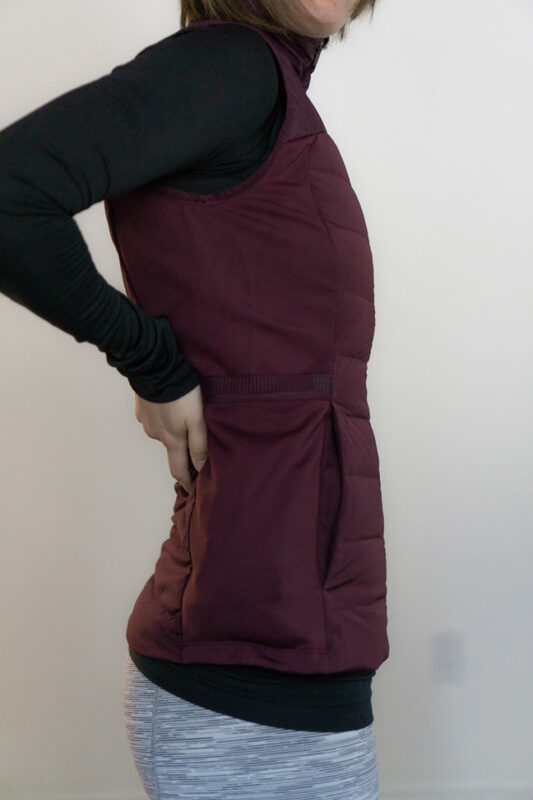 The vest features 4 generously sized pockets: 2 zip pockets in front, and 2 side pockets. The side pockets are enormous and could easily fit a large phone or other accessories inside. In the photo above, my iPhone 7 is completely inside and I’m pointing to the top of it. 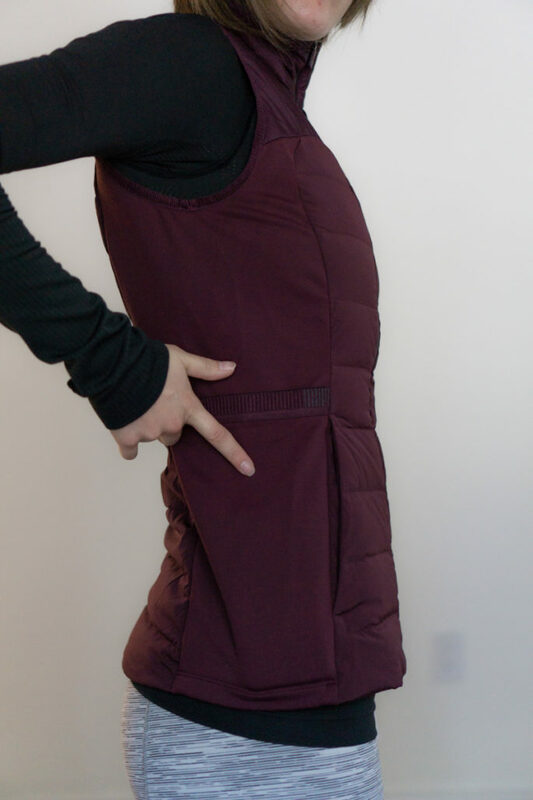 The pocket is 6″ wide at the top (on a size 2), nearly twice as large as the side pockets on lululemon’s down for a run vest. 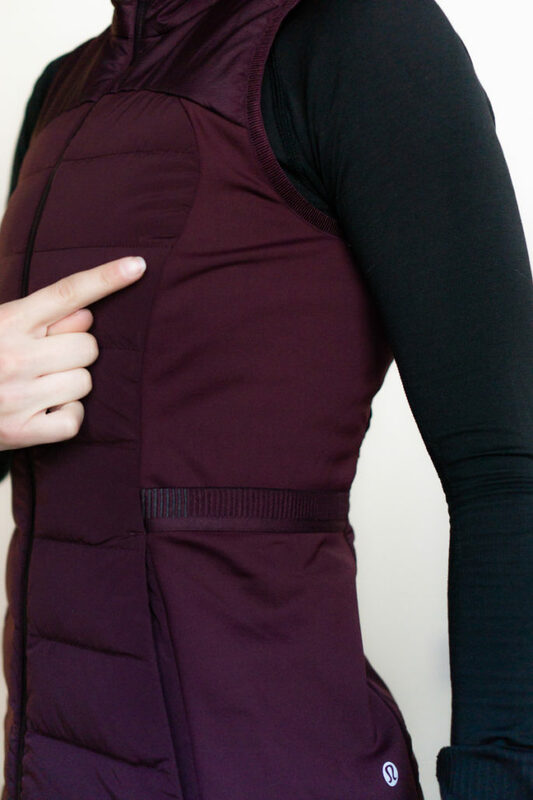 The pockets start where the elastic that you see in the photos and extend all the way down to the bottom of the vest. These photos show a pair of running gloves stuffed partially inside and then fully inside. Reflective details are unfortunately pretty minimal. There is a small block of reflectivity at the front and back of the elastic of both side pockets (visible in the photos above), but that’s it. The downside of the side pockets is that I didn’t find the elastic band comfortable. It hits around the narrowest part of my waist and was noticeable when worn. The sensation of the elastic against my waist felt just slightly annoying to me. Despite the generally flattering fit, the top half of the vest lays strangely against my body. It doesn’t quite conform to my shape like my other vests. I believe one of the reasons for this was some puckering I noticed just above the armpit where the fabric pulled at my bust. In general, the fit didn’t feel quite as flexible as previous styles. This wasn’t a dealbreaker by itself, but I did expect better. Another odd thing I noticed is the zipper was a bit tough and sticky. 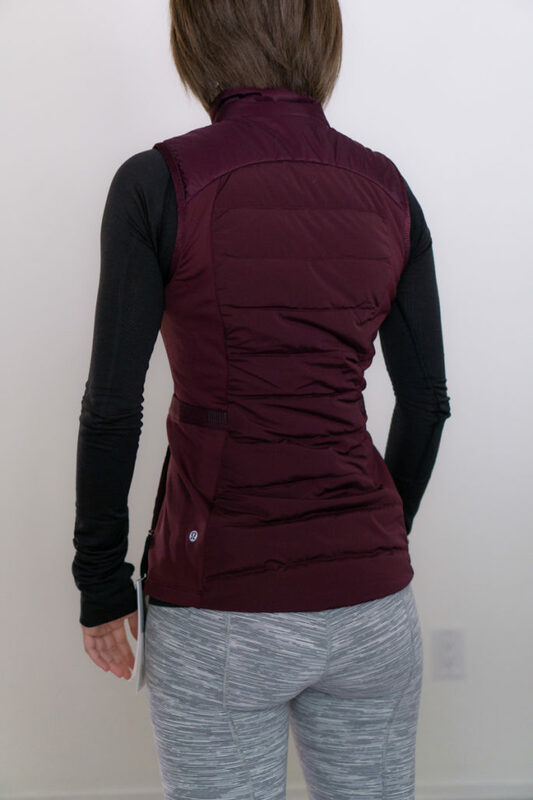 It doesn’t get completely stuck, it just doesn’t glide as easily as most of my lulu jackets and vests. 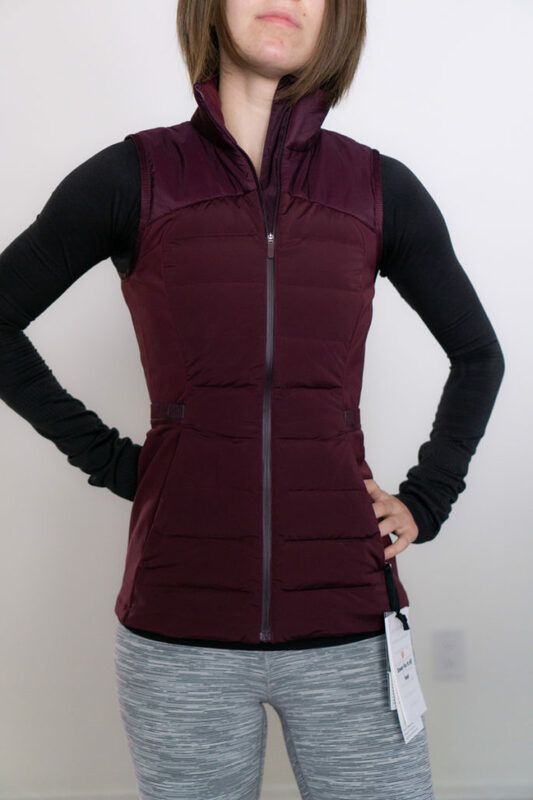 To recap, the positives of the vest include good warmth for its weight, generous storage options, and water resistant properties. The negatives are the sticky zipper, minimal reflectivity for shorter days, and odd fit at the side pockets and chest. Overall, this vest underwhelmed me and will be going back. At $148, I’m definitely picky about fit and comfort, and it didn’t quite deliver. I like my older down for a run and fluff off vests better, so I’ll be sticking with those this season. If you’d like to give the down for it all vest a try, it’s currently available online here. Thanks for the review. 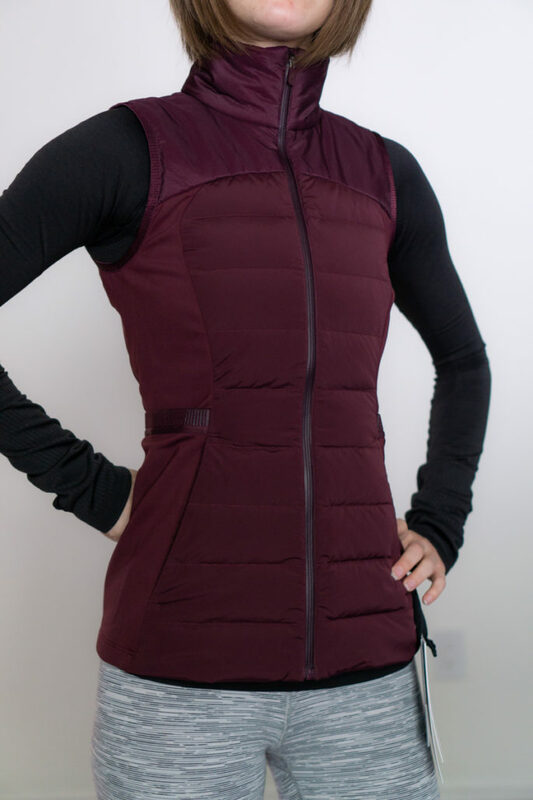 I was considering this vest to replace my old Lulu running vest but I will stick it out with the old one (which is perfectly fine btw – :-) ). What’s with the sticky zippers lately? Just purchased a press pause jacket with the same issue. Super annoying. Thanks for doing a Lulu review! I miss those. I agree, it’s a nice colour, but if mid band is not comfortable it has to go back. Yeah, most of the lulu I buy (which isn’t a ton currently) is just more colors of what I already have. A lot of the designs seem to be fairly minimalist, so I haven’t been as tempted by a lot of new styles recently. So interesting that you had the fit issues! I got this vest in black two weeks ago and love it! It’s a close fit for sure, but it lays flat for me and I didn’t find the elastic noticeable. I do have a very small bust (hehe), so maybe that’s why it works. Always love your fit reviews! I’m glad it worked out for you! It could also be a height/torso length thing–who knows. Hi, I am a QUT student collecting public data on how the brand lululemon is experienced. Data usage is exclusive to my project (see file:///C:/Users/karti/OneDrive/Documents/LIZ/brand%20analysis/RecruitmentSheet%20(1).htm for detail). If you do not consent for your post to be used let me know by [12/04/2019].